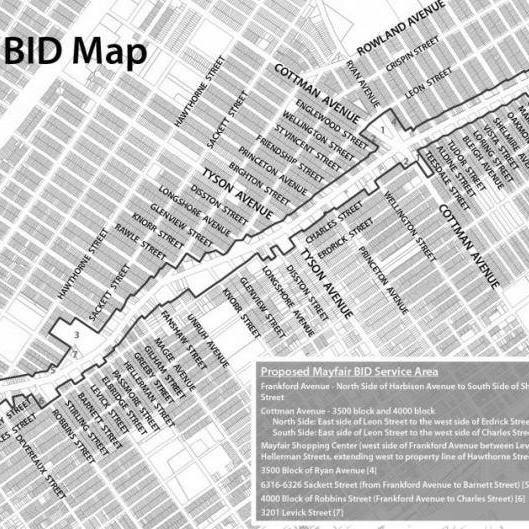 The Mayfair Business Improvement District, enacted by Philadelphia City Council in December 2015, seeks to foster a vibrant and inviting commercial district within Mayfair through activities including cleaning and public safety activities, marketing and capital improvements. – Frankford Avenue from the north side of Harbison Avenue to south side of Sheffield Street, beginning with 6200 Frankford Avenue and continuing to Sheffield Street. On the west side of Frankford Avenue, the northern terminus property currently carries the address of 7556 Frankford Avenue. On the east side of Frankford Avenue, the Service Area terminates with the property currently carrying the address of 7645 Frankford Avenue).